The Best Western Eglinton Arms has a long-standing tradition in the south side of Glasgow as a quality establishment. The Hotel has just had a £1.2 million refurbishment of the entire 18th century property, retaining many of the original external features of the hotel. This boutique hotel has a modern contemporary theme retaining a Scottish feel throughout, with feature fireplaces and soft furnishings. The hotel has the cosy atmosphere to be expected in a country style location, and can be trusted to be your home from home in Eaglesham. 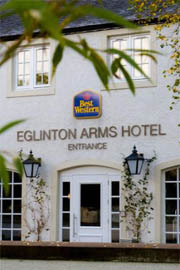 Best Western Eglinton Arms has bedrooms to cater for all requirements, whether on business for a day or two or for a short break just to get away from it all. 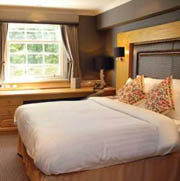 All sumptously decorated en-suite rooms are bright and airy, designed with comfort in mind to a high specification. Many have picturesque views of the Orry and local park. Others along the apex have high set windows, electronically operated by remote control. * Flat screen digital t.v. 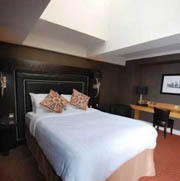 With 35 single, double and twin rooms, there are adjoining family rooms also available. There are rooms designed for guests with special needs. All rooms are on the first floor, with lift access. In keeping with the 18th century listed building, the Bar & Grill has maintained an old world feeling of a traditional coaching inn, offering good quality and freshly prepared food.